A quick post to share the great news with everyone. The Writer’s Almanac archive is now back on-line! I received this note via email earlier today. Happy Poetry Month, indeed. 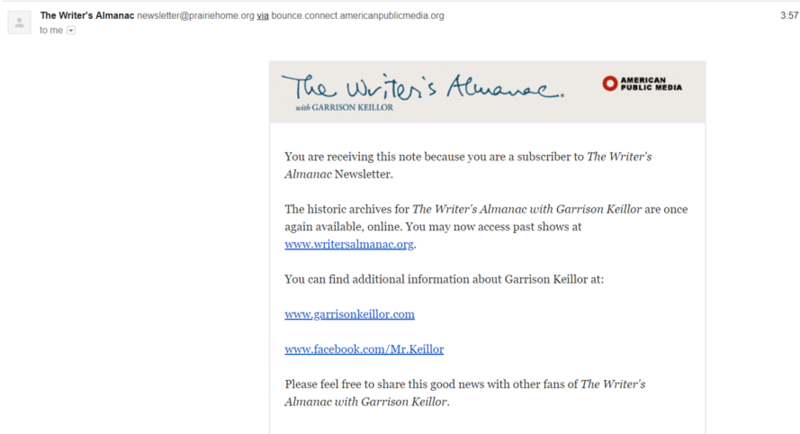 Thank you, Minnesota Public Radio and Mr. Keillor. “how far it went,” their tender friendship. his guardian angel, beloved friend. leaving us nothing to overhear. Lisel Mueller, “Romantics” from Alive Together: New and Selected Poems. (Louisiana State University Press, 1996). Copyright © 1996 by Lisel Mueller. Fellow poetry reader Bob S. asked on our post “Garrison Keillor, Good Poems, and “Bear In Mind” by John Martin“ if anyone had a listing of the readers for the audiobook version of Keillor’s Good Poems. (I found a partial list which I shared with Bob in the comments, but I couldn’t answer his primary question, which was…:) More specifically, does anyone know the female who read Lisel Mueller’s poem “Romantics”? And a follow-up question: How important is it to you to be able to listen to a poem as you read along? I know many people enjoyed listening to Keillor read his daily poem choices at The Writer’s Almanac. Is that (being able to listen to poems) something that would be valuable to readers here? I sometimes link to YouTube videos of poets reading their material, but not regularly; would you like me to do more of that? Or what if I read a poem for you from time to time? 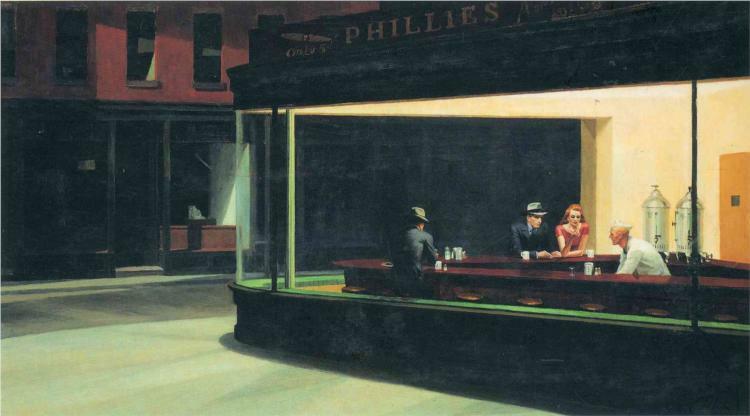 This site would not exist without Garrison Keillor. For it was in his book Good Poems that I first read the poem that would go on to change–and save–my life, “Wild Geese” by Mary Oliver. His daily poem at The Writer’s Almanac was often the highlight of my day, and many of his offerings found their way here to this very site. Minnesota Public Radio has ended distribution and broadcast of The Writer’s Almanac effective immediately. Today is a sad day for poetry lovers. MPR said only that it received a single allegation of “inappropriate behavior” against Keillor last month about an alleged incident during his time hosting “A Prairie Home Companion.” Keillor retired as host of the radio variety show last year, but continued to work for MPR on various projects. MPR said it would rename the show now hosted by Thile (“A Prairie Home Companion”) and end distribution of “The Writer’s Almanac,” Keillor’s daily reading of a poem and telling of literary events. MPR also plans to end rebroadcasts of “The Best of A Prairie Home Companion” hosted by Keillor. All personal opinions aside, this is a heart-breaking day for me and for all poetry lovers. he’s always gaining on me. know you aren’t going to catch me. we both know I’ll never catch you. “Bear In Mind” by John Martin from Hold This. © Concrete Wolf Press, 2017. Mary Oliver, A Thousand Mornings. Soul Horse is coordinating efforts to rescue horses and livestock, as well as hay transport. I fell in love with Randi Collier’s facebook page and all of the photos of local cowboys taking on the “hard” or “impossible” rescues. Specific needs and how to donate (mostly need $ to cover fuel and transportation). The Harris County (Houston, TX) Animal Shelter has an Amazon Wishlist. This Facebook Group “Texas Shelters Donations/Supply List Needs” has several organizations’ Amazon Wishlists posted. If you cannot give money or items, please consider giving blood. A funny thing happened during my hiatus at the beginning of the year. I began to question my need for written poetry–for words and writing in general–until I had convinced myself that I truly didn’t need it, that it was a luxury . . . a fluffy, cloud-chasing time-consumer that distracted me from living a three-dimensional life. Poetry was to be found in the natural world around me, I rationalized, in the act of living itself. I wanted to see if I could live without the words and, instead, focus on the experience. I say it was funny, but in reality it was rather sad. What I found–and I see this now in retrospect–was that I grew flatter and more isolated; I was living in “3-D”, but without an outlet, I was left living in my own head, trying to process my own thoughts . . . I wasn’t reading poetry, so I wasn’t reminded that those feelings I had floating around were part of the human condition, and I wasn’t writing, so my feelings remained stuck and repressed, until, I’m convinced, they manifested themselves as illness. I grew ill–physically and mentally–and, ironically, I couldn’t even live the three-dimensional life I had so craved. I was the untethered elephant Stafford had warned us about. I had gotten “lost in the dark,” and I did not “recognize the fact” until much later. a shrug that lets the fragile sequence break. Poetry had laid back and played dead, I thought, but perhaps it was I who had betrayed it by shrugging away. So it was one evening in the midst of a sleepless slumber that I turned once again to poetry–not just any poetry, the very poetry I had shared here. I went back to the beginning, and I began reading, again. And perhaps here’s the funny thing . . . I began to feel better. Some things we can’t explain, they must be taken on faith, but I am convinced that some people simply need poetry–need words–to survive. Or maybe not to survive, but definitely to thrive. I shared with a friend this morning (regarding technical versus creative writing), “It’s like eating rice and beans every single day. It will sustain you, but it won’t fulfill you.” The things I had turned to in lieu of written poetry had kept me alive, but hadn’t kept me healthy. I was surviving, but I certainly wasn’t thriving. But as with anything, balance is key, and that’s what my life had been missing all along. I know many of you found strength and solace here in these daily poetry and words posts. I know I led you to believe that I would be back sooner than now. I know many of you must have wondered what happened. I imagine one or two of you may have even felt let down by my unexplained absence. I apologize, I hope you can forgive me. I wasn’t well, but I have returned, and I am healing. I have missed poetry. I have missed you. I may struggle to find that elusive balance for a bit. Posts may be intermittent and unpredictable, but perhaps that can be a good thing. A little spontaneity, a little surprise; I hear they can be chicken soup for the soul. And where exactly does one begin? Well at the beginning, of course. And so it is that we return to the beginning. To the very first poem I posted here, to the very poem that first saved my life, to the very poem that saves it again. “Wild Geese” by Mary Oliver, Dream Work.